“The Stomp” is a “non-denominational” (all styles) dance party held a few times every year. Supported by Rotary, it has raised over $40,000 for needy charities since the first “Stomp” was run in support of tsunami victims back in 2005 (I was a member of the organising committee 2005-2006 and continue to attend whenever I can!). 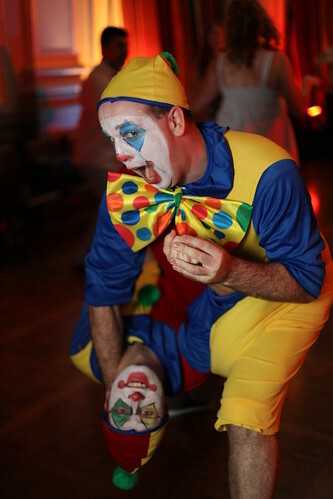 The latest Stomp was held last night, entitled “Cirque de Stomp” – a circus theme. Although I spent most of the night dancing, I brought the camera along to take pictures while I was resting between sets. Here are some of my favourites, all shot with my trusty Canon 50mm f/1.4 USM. Crossfire: A freaky one-in-a-thousand chance shot: I used a Speedlite bounced behind to the right… but another photographer happened to take a flash shot from the other side of the room at exactly the same moment. As a result the frame was overexposed, but the effect is quite striking due to the dancers’ poses – as if they’re being pushed back by the light. ~ by Q on April 5, 2009.